Using kitchen shears, cut along the center of the back of the lobster tails from the opening to the tail fin. Turn the tail over and repeat the same cut on the softer side. Using a sharp knife, cut through the meat and the tail fin to create two halves. Clean out the intestinal tract, if present. Repeat with the remaining lobster tails. Melt 1 Tbs. of the butter in an 8-inch skillet over medium heat. Add the garlic and cook, stirring occasionally, until golden brown, about 2 minutes. Transfer the mixture to a medium bowl and let cool for 3 minutes. Add the remaining 4 Tbs. butter, lemon juice and zest, hot sauce, lime zest, and salt; mix well. Generously brush the meat with the butter mixture. Place the tails, shell side up, on the grate and close the lid. Grill until the meat of the tails is lightly marked, about 3 minutes. Dollop the remaining butter over the lobster meat, close the lid, and grill until the lobster meat is firm, moist, and opaque, 2 to 3 minutes more. 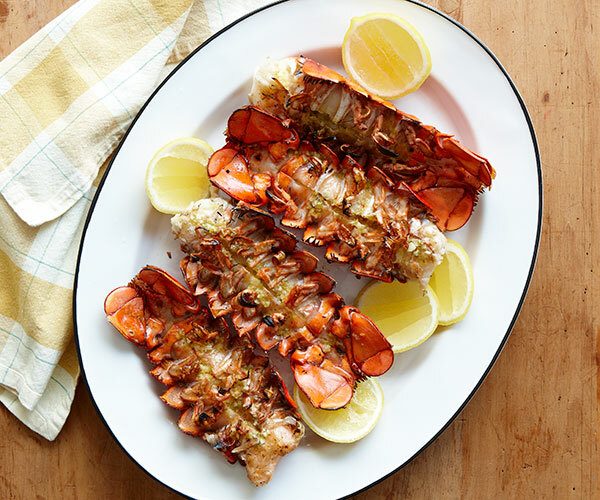 Remove from the grill and serve warm, room temperature, or chilled as part of a lobster salad.